This weekend we did our first SAC tour, and first hochtour, of the year: the Grande Lui. 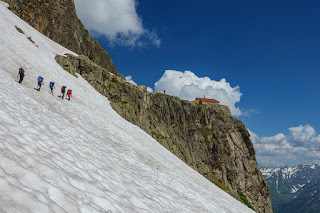 .....over a few snow fields and then up a long series of switchbacks before crossing the big snowfield to the scrambly ascent (with a chain) up to the Cab. de l'A Neuve. We hang out and enjoy the sun and great views for the rest of the day. After a so-so meal (it's the first weekend that they are open, but still...) we do a bit of route planning for the next day. Greg and R do a quick "reco-tour" across the snow field to check out conditions and establish a path for the morning (some "fun" for greg as we reverse this and there's a bit of steep descent on snow... always a favorite). We hang out a bit longer and then head off to bed. The morning starts early: up at 4 and we're underway by 5:20 (the Huettenwartin overslept, so it's a bit slow). Conditions are fantastic: full moon, clear sky, not too cold. We put on the crampons up top and then descend through the "couloir" to the snowfield (great way to start the day...). Once on the snow we cross over to the moraine, head up that, and then continue up, up until we hit the bit that's still glacier. Here we rope up into two teams and then continue heading up, up, up. The going is easy despite heavily sun cupped snow (though there's a bit too much traversing steep slopes for greg's taste) and we make it up onto the broad glacier at about 3300m in good time. From here we ascend a bit more to the steep snow field that heads up to the Col de la Grande Lui. Now there's a slowdown as we carefully make our way up this (the snow is great, so it's not too bad) and then transition onto the rock. 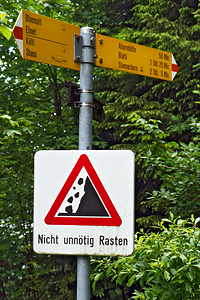 Off with the crampons and then up, up, carefully through the loose rock to the peak. From here it's clear that doing the traverse isn't feasible: there are too many unknowns and it's a bit too late, so we decide to head back the way we came up. 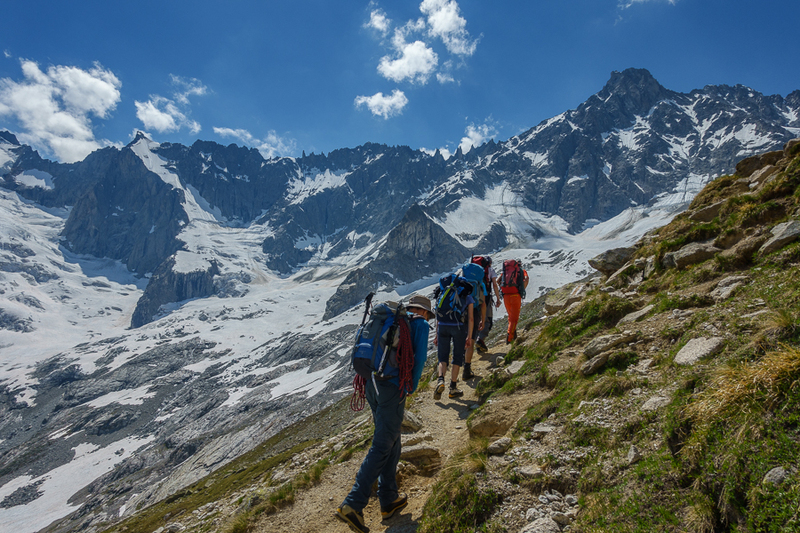 We enjoy a nice break and rest along with the really nice views (though unfortunately not the Mont Blanc!) before starting back down. 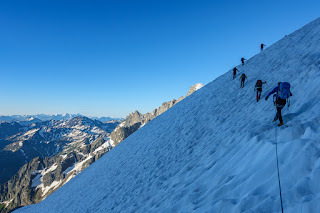 We choose a different route down, following the other group that had come up at the roughly the same time as us, spend more time on the loose rock (reminiscent of the Piz Kesch) and transition back onto the snow below the steepest part. From here it's back the way we came up to the hut. 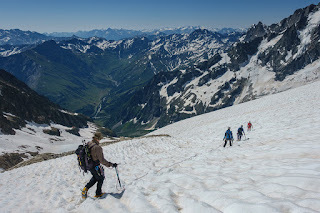 The snow is lovely, so once we get down below the glacier and take off the crampons we can do some nice glissading down. Back at the hut we enjoy a break in the sun (and some cake!) before packing away all the gear and starting the long walk back to La Fouly. We do get to enjoy some more good glissading at the top, but it's hot, so by the time we've made it back to town we're all very ready for a cool drink while waiting for the bus. The public transportation is exactly as crowded as one would expect on a sunny Sunday afternoon, so things are full. Still, aside from the bus from La Fouly (which is stupid full), we manage to get seats the rest of the way.